The Antique Partners Desk was first seen in the late Georgian period in Britain. It was designed for professionals with larger offices, like banks, solicitors and accountants. These new larger desks had a working bank of drawers and cupboards on both sides enabling two people to sit and work at them on either side comfortably and facing each other. Antique partners desks were real statement pieces and came with a generous sized knee hole, ideal to fit an office chair. Because these pieces of antique furniture were built for professional tradesmen or senior officials, they were high up in society therefore they are usually constructed from superb quality timbers as no expense would have been spared in making them. They will usually have high quality brass wear, along with leather tops and made from solid timbers such as Mahogany, Oak or Walnut. Have a look below at our lovely examples available for sale. Below are more examples of antique partners desks that we have sold, we often get lovely examples in stock but if any style looks of interest let us know and we can try to find you something similar. 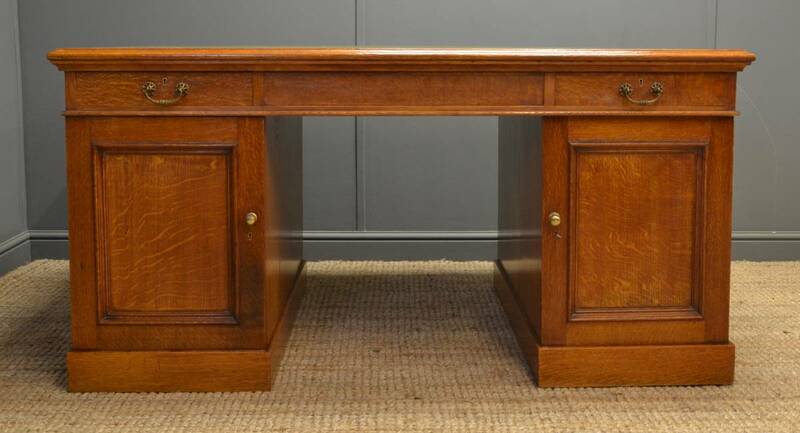 Stunning Quality Antique Scottish Victorian Oak Partners Desk. 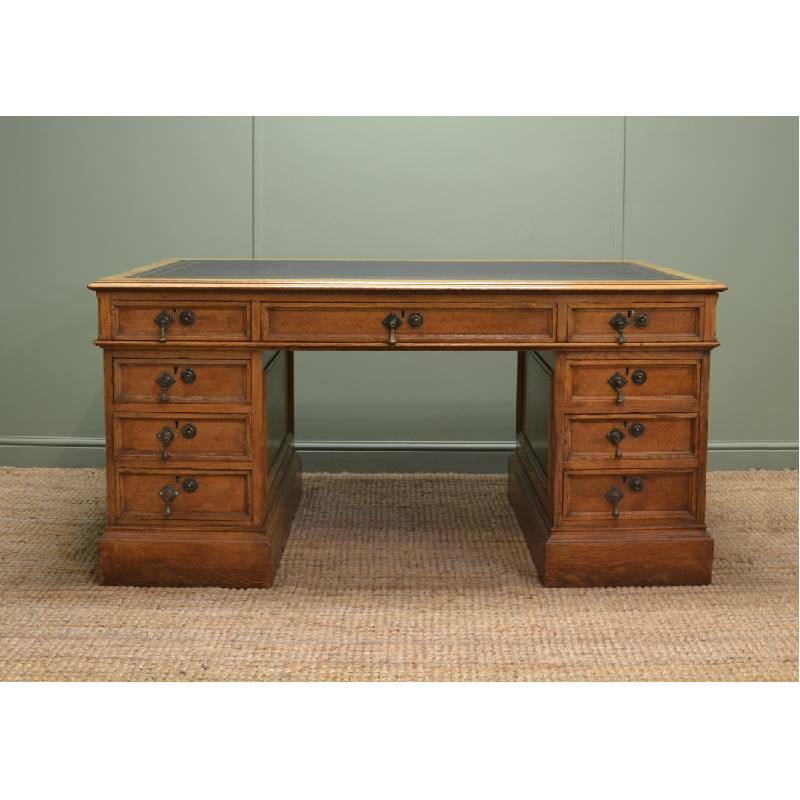 This true partners desk dates from the Victorian period, circa 1880, is constructed from oak and is of stunning quality. 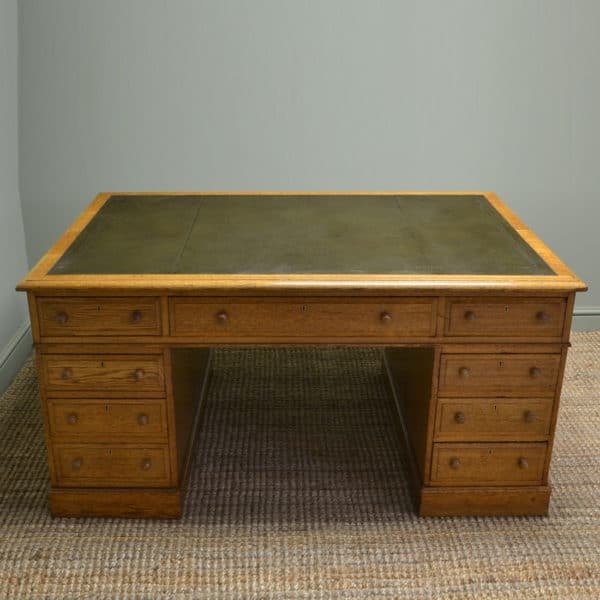 It is an extremely clean and tidy piece for its age and worth noting that to have a desk like this made today, to these exacting standards, you would be talking in the region of £10k! This original version is a bargain in comparison. 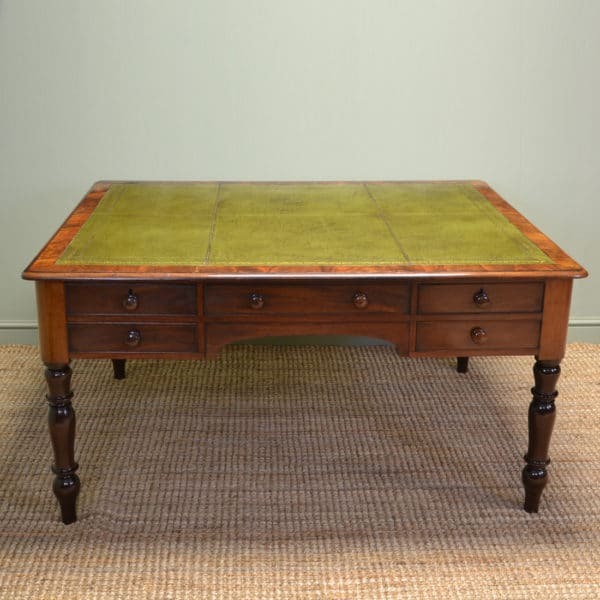 It has a rectangular moulded top with a green tooled leather writing insert over a centrally located oak lined drawer above a large knee hole. The desk rests on two pedestals, on one side each pedestal has four oak lined drawers with original brass swan neck handles. On the opposite side each pedestal has a small oak lined drawer above a cupboard door displaying deep moulded edges and brass handles. The interior of each cupboard has a central removable shelf. The desk also has a key with one working lock and stands on a plain plinth. The piece originates from Scotland with evidence that it was actually made there, the locks on the desk being stamped ‘J & T. Scott, Edinburgh’. 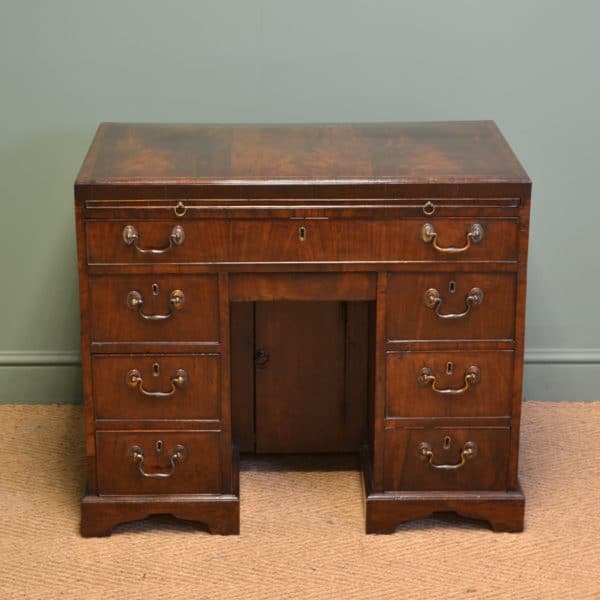 This stunning antique desk is a real find, the quality of both materials used and craftsmanship evident in its making are hard to find in today’s world. It also has the added benefit of the charm only associated with a piece of antiquity, something that can never be found from a new piece! It is a lovely rich warm shade of oak (very desirable in the current market) with a striking grain, good patina, is in very good condition and has been beautifully cleaned using a traditional form of wax finishing. 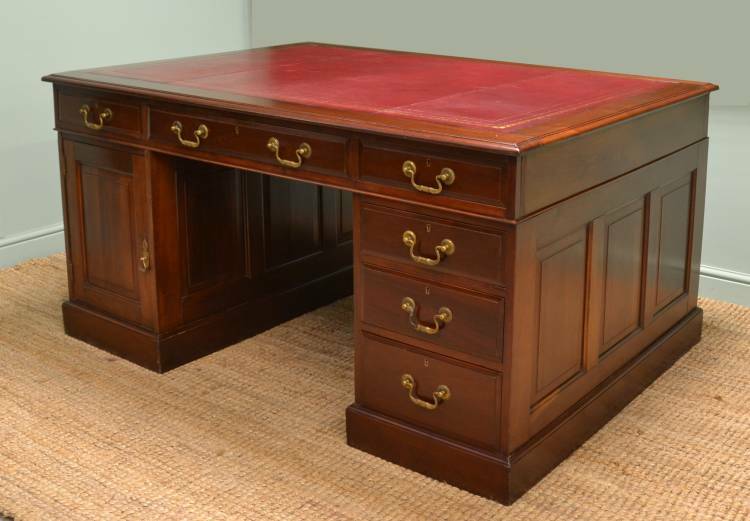 Stunning, Large, Victorian Antique Mahogany Partners Desk. 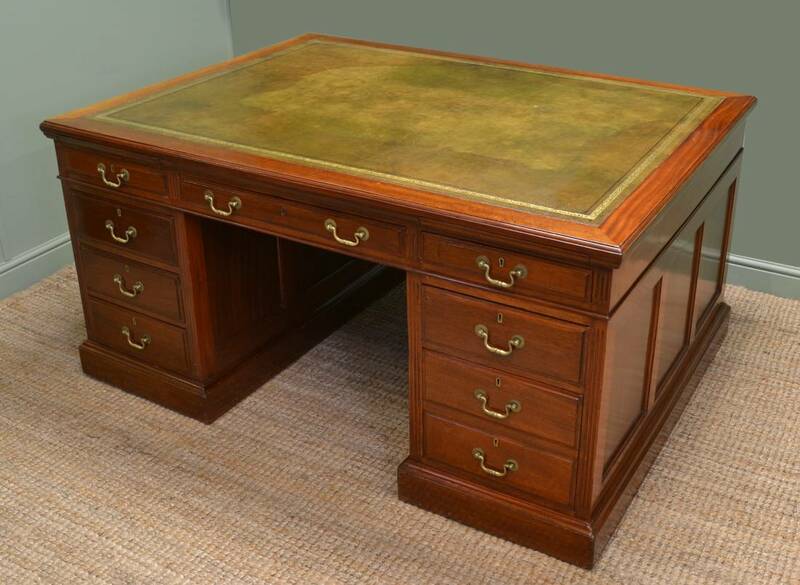 This very impressive antique mahogany partners desk dates from the Victorian period, circa 1870. It is of stunning quality with wonderfully large proportions with a definite wow factor. The combination of quality and proportions displayed by this desk makes it a very unusual find which we are very pleased to offer for sale. The rectangular moulded top is inset with a black tooled leather writing surface and sits above a central drawer over knee hole. The left pedestal has four graduating drawers with moulded edges and turned handles. The right pedestal has a single drawer over a cupboard door which displays beautiful figuring and turned handle. This is a true partners desk whereby each side is a mirror image of the other. The only difference being the internal make up of the cupboards, one of which has a later added shelf providing more versatile storage. The desk sits on a moulded plinth with castors and has been beautifully restored and French polished. Desks of this size and quality are not often available for sale on the open market. A modern equivalent would cost around £10k to be made to a bespoke order. This desks offers the potential buyer a chance to own an original for a fraction of the cost. 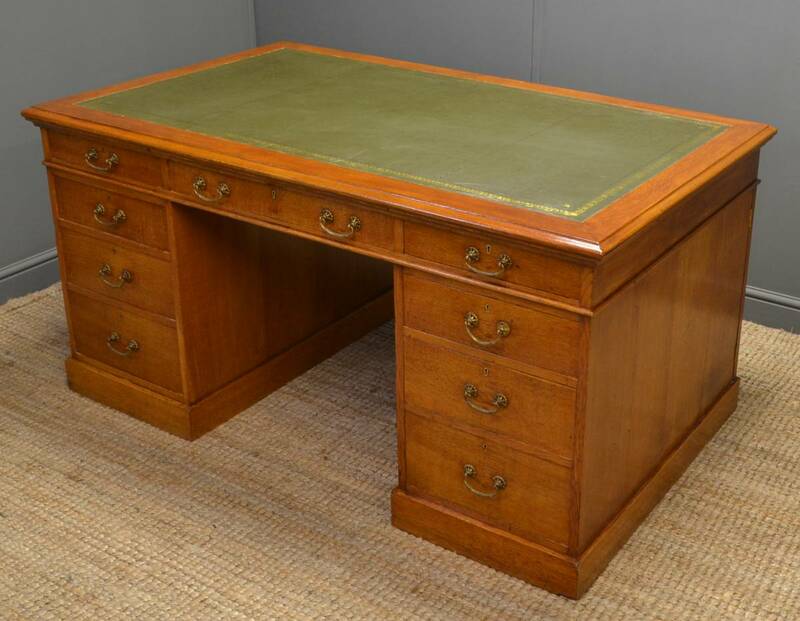 Large Victorian Golden Oak Antique Partners Desk. This fabulous example of a large antique Victorian partners desk dates from around 1870 and is a wonderful golden shade of oak. It has a rectangular moulded top with rounded corners with a green tooled faux leather writing insert. Each side of the desk offers slightly different storage options. One side has a wide central oak lined drawer above a very generously sized knee hole flanked by two pedestals, these each contain four graduating oak lined drawers with brass handles. The opposite side has three oak lined drawers above two cupboards with unusual brass release buttons. Each interior has a single removable shelf. This stunning antique true partners desk is unusually large, a real statement piece, that stands proudly on a plain plinth with castors. It splits into three sections, making transportation easier than one might think. Large Solid Walnut Victorian True Antique Partners Desk. 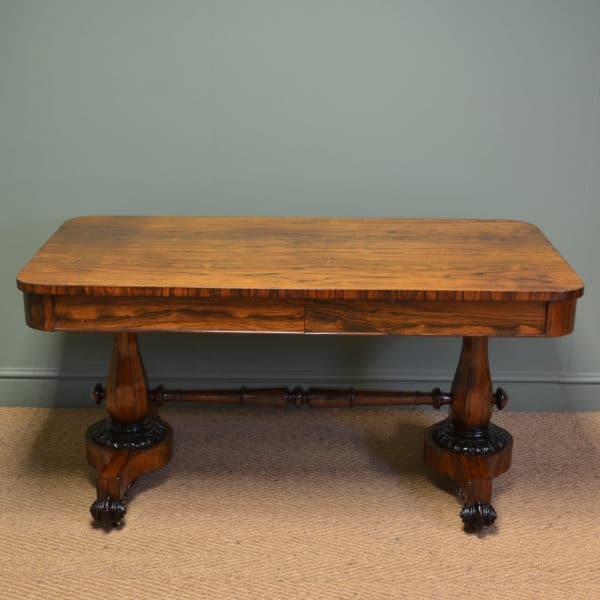 This very impressive solid walnut antique Victorian ‘true’ partners desk dates from around 1890. It has been polished to a very high standard and deserves to be the centre piece of a grand office or reception desk to a boutique hotel. It has a rectangular moulded top with tooled burgundy leather writing insert. This sits above the base, each side of which being a mirror image of the other. Each side has a central oak lined drawer with brass swan neck handles above a wide knee hole. The left hand pedestal contains a drawer over cupboard with original brass handle. The only difference between the two cupboards being one has two shelves while the other has been left open for storage. The right hand pedestal has four graduating oak lined drawers, again with original brass swan neck handles. This beautiful antique desk has stylish panelled sides, stands on a moulded plinth and splits into three sections, aiding removal. 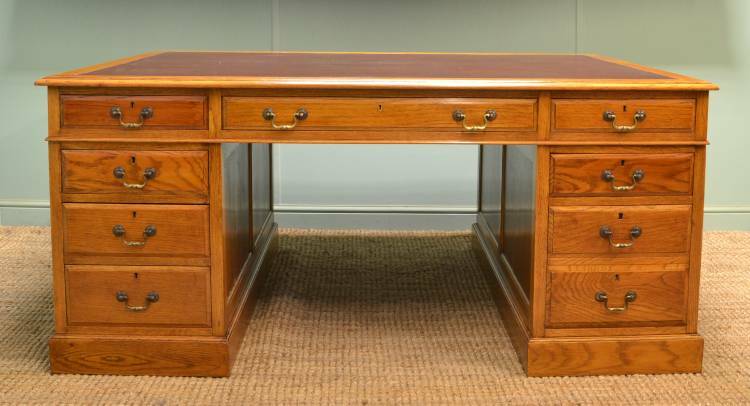 Magnificent Antique Edwardian Quality Oak Partners Desk. 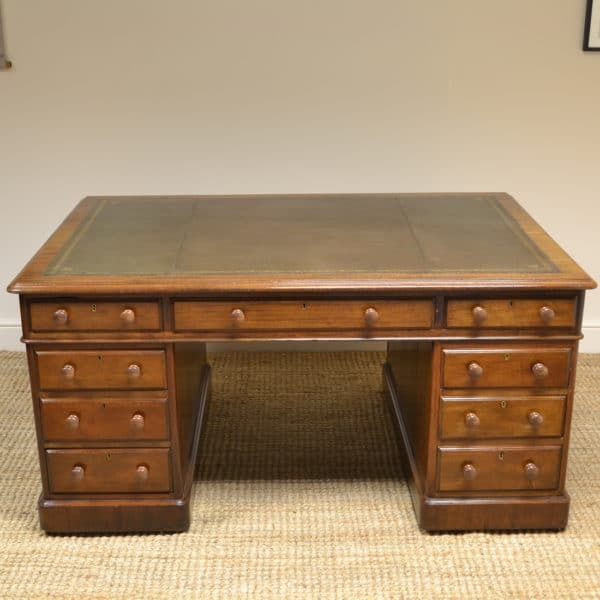 This huge Edwardian, circa 1910, antique oak partners desk is of superb quality and has impressively grand proportions. It has a rectangular moulded top with a beautifully figured edge and original brown tooled leather writing insert. The ‘executive’ side has a central drawer over large knee hole between two pedestals. The left pedestal contains four graduating drawers while the right pedestal contains two small drawers above a single deep drawer with file dividers. All the drawers have the original brass swan neck handles. The ‘clerks’ side has two working cupboard doors with delightfully figured panels, the interiors of which have removable shelves. This impressive antique desk stands proudly on a moulded plinth, has paneled sides and splits into three sections aiding transportation. It truly is a magnificent piece of antique furniture and deserves pride of place in a large office. A new bespoke desk of this quality and size would costs over £10k to commission, this is a more affordable alternative and arguably the better investment. 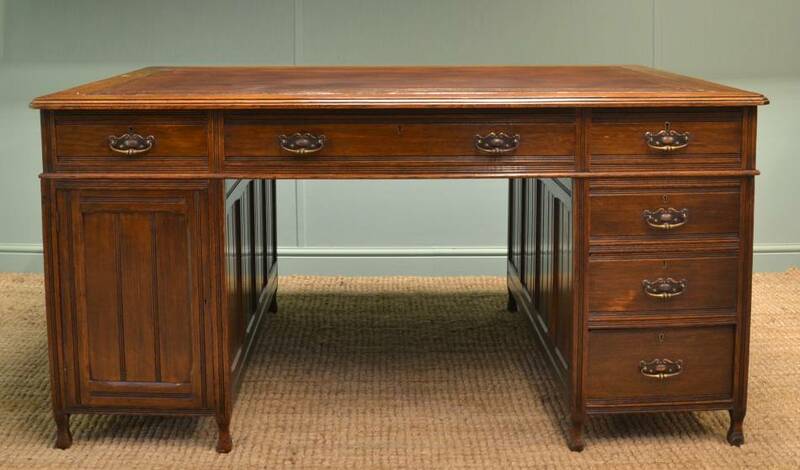 Large Victorian Oak Antique True Partners Desk. 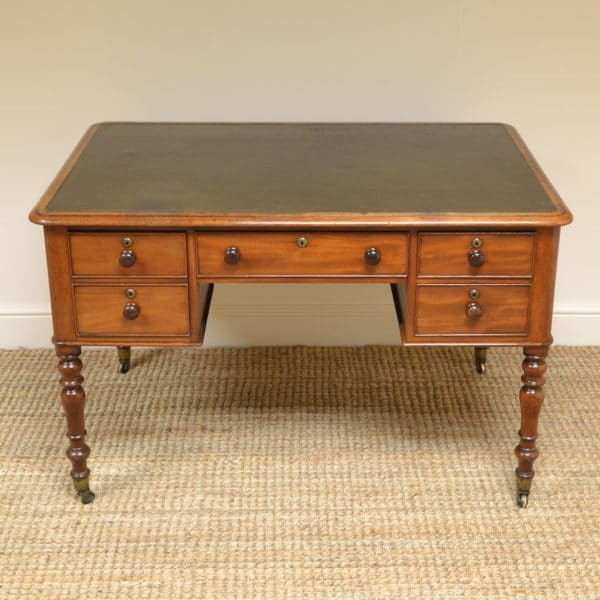 This fabulous antique oak desk dates from the Victorian period, circa 1890, and is a true ‘partners’ design. It has a rectangular moulded top with canted corners inset with a brown tooled leather writing surface. Each side is a mirror image of the other having working drawers and a cupboard. 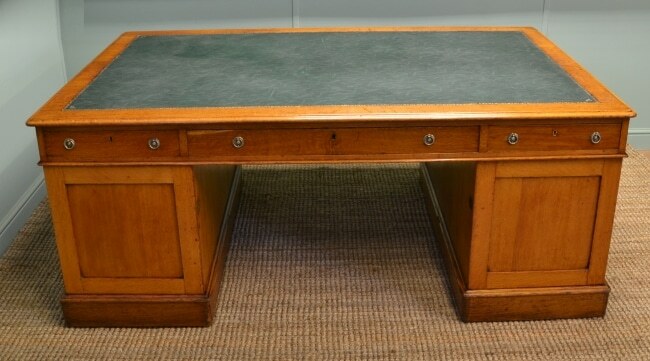 Unusual Victorian Oak Antique Partners Desk. Dating from around 1880 in the Victorian period this lovely oak partners desk is quite unusual in style. It has a moulded top with rounded corners and an inverted break front on the ‘Managers’ side. The top also has a central green faux leather writing insert. Both sides have working cupboard doors with moulded central panels. The managers side has three working oak lined drawers within the cupboard to the right, one having fitted stationary dividers. 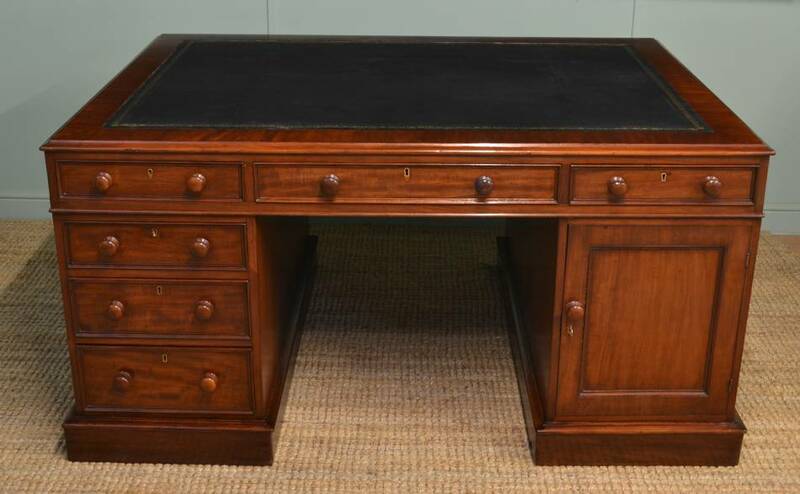 Large Antique Edwardian Mahogany True Partners Desk. 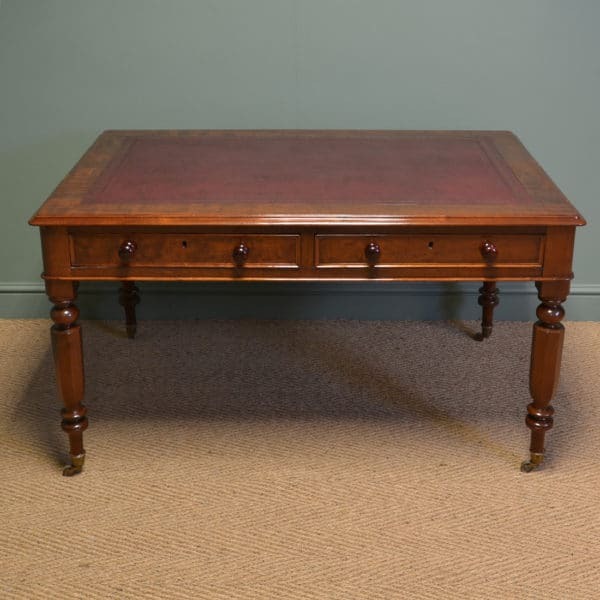 Dating from around 1910 in the Edwardian period this antique desk is in the true partners style and made from mahogany. It has a rectangular moulded top with central green tooled leather writing insert. Each side of the desk is a mirror image of the other having the same drawer configuration all of which have moulded edges and brass swan neck handles. 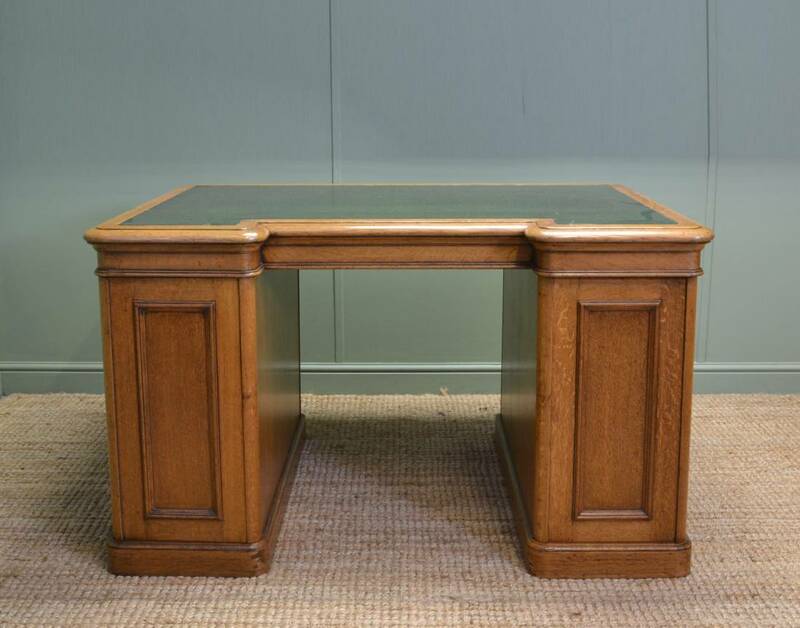 Quality Victorian Solid Oak Antiques Partners Desk. 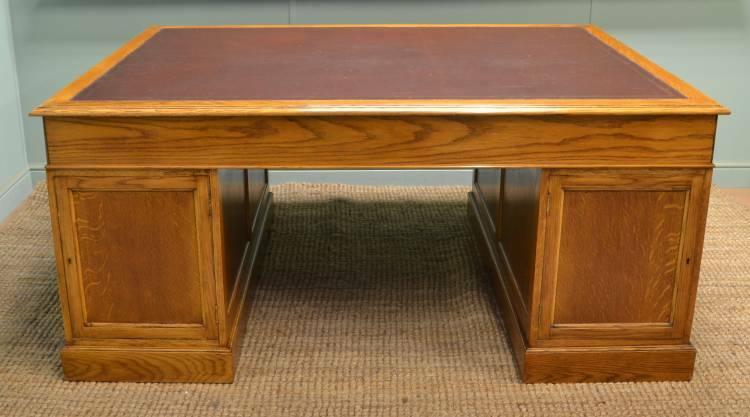 This fabulous Arts & Crafts solid oak antique partners desk dates from the Victorian period, circa 1900. 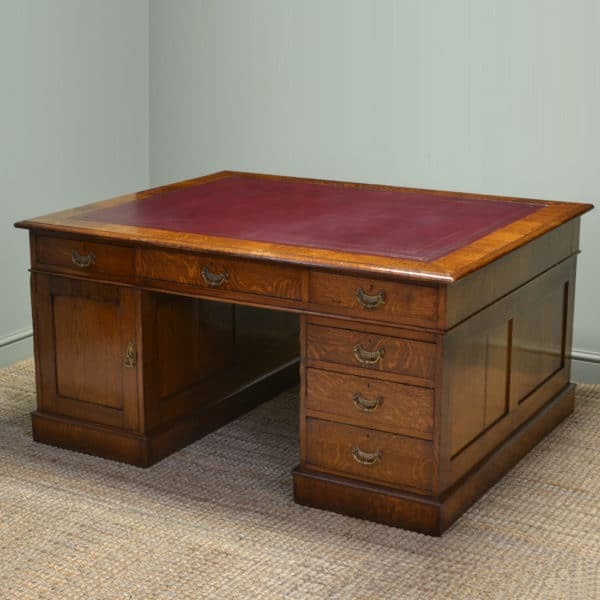 This superb quality desk has a very unusual locking mechanism by “Kaye’s of Leeds, 93 High Holborn, London” which is fully working and comes complete with a single key. The desk has a rectangular moulded top with black tooled leather writing insert. The foremost side of the desk displays a wide mahogany lined drawer over a large knee hole flanked by two pedestals. Each pedestal contains four graduating mahogany lined drawers with moulded edges and beautifully figured quarter veneered oak fronts. Each drawer front also has a key hole, locking button and drop handle. The quality and finish of this desk is superb made to exacting standards. The craftsmanship needed to work the quarter veneered panels and create the overall finish of the desk is self evident. It truly is a magnificent piece which, if commissioned today, would cost in the region of £10k to make to this specification with the same quality of materials. I have my writing desk ... Victorian circa 1890 walnut with red leather insert. AMAZING though i would have loved the keys to lock the drawers. delivered in perfect condition (well for 130 years old perfect). I only ask if Driscolls can fine me a small walnut chest of drawers to go with it! 5 or 10 stars all the way for me. Thank you so much.